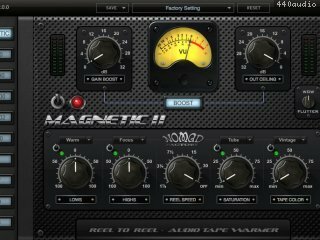 Magnetic is a Reel-to-Reel Audio Tape Warming effect that gives your tracks the elusive vintage tape sound which your ears crave. This effect can inject sterile audio with the warmth and character of classic tube circuitry and analog tape saturation. The plug-in features pure analog reel-to-reel tape speeds, tape/tube saturation and tape color effects, as well as a dedicated vintage style EQ and a built in Boost mastering section. The result is a creamy, warm sound that can only be achieved by Magnetic. Magnetic can be used in many different musical ways. Try using it on individual tracks to add subtle warmth and tape color to your drums or use it to create a filtered cassette AM-radio effect on a vocal. But that's not all… when used on the master bus, Magnetic can warm your entire mix and "boost" it up to broadcast level. It's just like having a 30+ year old reel-to-reel tape machine at your fingertips, without all the maintenance costs. 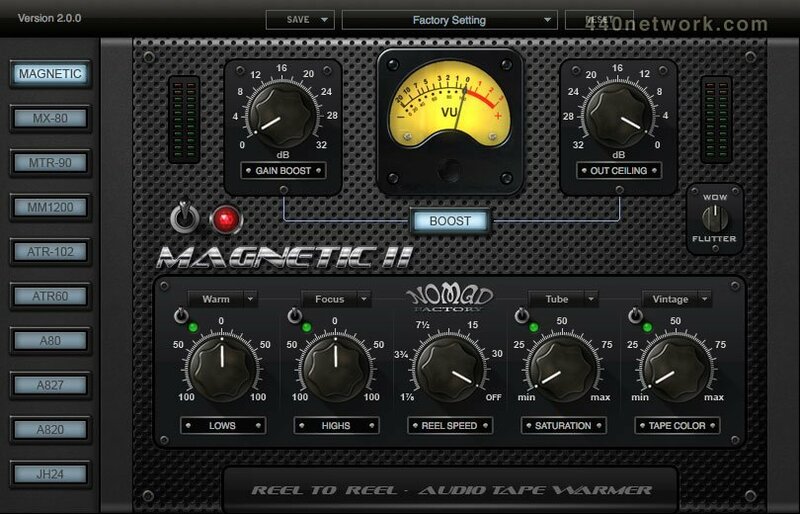 - Reel speed controls the speed of the virtual tape machine. Higher speeds give you more studio-quality fidelity; lower speeds sound more like a cassette tape. The DASH setting gives you the highest-fidelity of digital audio tape predominately used in the 80's and 90's. - Saturation gives different levels of tube and/or tape saturation effects. Recreates the warmth and character of classic tube circuitry and analog tape saturation. - Tape Color provides the highly sought-after sound of Natural, Vintage and Modern Tape Compression. - Lows controls the amount of low frequency equalization. Select the boost/cut frequency range with the Body, Warm, and Lush Settings. - Highs control the amount of high frequency equalization. Select the boost/cut frequency range with the Detail, Focus and Brilliance Settings. - Boost switches on/off the built-in Mastering Limiter section. This incorporates multiple stages of limiting and a look-ahead brickwall limiter to deliver first-class peak reduction. Adjust the Gain and Ceiling Knobs to achieve High-Resolution Limiting. - Gain sets the threshold for the incoming signal. Higher settings result in a louder sound. - Ceiling sets the brickwall output level so that it limits all peaks above the number it is set to. - VU Meter shows the amount of limiting taken place when the Boost circuit is engaged. - Power bypasses the entire unit. All Nomad Factory software AAX 32 & 64 bit compatible with Pro Tools 10.3.6 & Pro Tools 11 (Mac & PC). COSMOS has been added to ISP3 bundle (re-authorization required using your ISP3 serial number). Rock Amp Legends is not AAX compatible because of technical issues. VST and AU versions GUI has beed optimized for Digital Performer 8 (Mac & PC). Changed C/R to serial number authorization, one license files can authorize 3 machines (MAC and/or PC). Added AAX format for ECHOES, MAGNETIC & MAGNETIC II. Added up/down presets controls for ECHOES, MAGNETIC & MAGNETIC II. Fixed LFO Sync speed for all modulation effects (Blue Tubes & Liquid Bundles). Fixed presets load/save for BlueVerb and Analog Signature Pack. Fixed multiple minor bugs and improved global stability. Fixed crashes and improved stability in Logic. Fixed automation crash when using multiple controls in AU format. Fixed NaN output samples problem that were causing third party plug-ins chained after Magnetic to crash. Fixed audio pops and clicks caused by internal buffers. Removed internal DC offset option, the added DC option was causing problems to Magnetic and not required as Magnetic doesn't generate DC offet. J'ai profité du prix de lancement ! j'aime bien l'impact donné par ce plug aux pistes de drums, de bass ou de grattes. ça cradouille et ça colore bien ! Bon rapport qualité prix. Pour colorer, il colore. Faut comme pour tout être mesuré! Mais quel son agréable. il ne réchauffe rien, c\'est pas un micro-onde, mais il ajoute ce petit quelque chose propre au son des années d\'avant le tout numérique.